Wigley’s Field allotments will be open during the Green Fair on Sunday 8th July between 11.00 am and 4.00 pm. The site is a pleasant 10 minute walk from Castle Square. To get there, leave the square via Dinham, cross Dinham Bridge by the Millennium Green and keep right. The allotments are just past the Cliffe Hotel. The site was established about 18 years ago and there are around 40 full and half plots, which are operated organically. Plot holders come from throughout the local community. 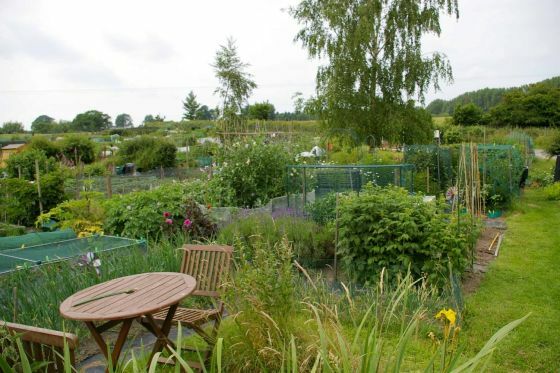 People manage their plots in different ways and grow a variety of vegetables, fruit and flowers. You are very welcome to come and visit us and look around. There will be tea, coffee and soft drinks with home-made cake, all for a donation to site funds. There may also be produce and preserves for you to take home. There will also be a scarecrow display, to be judged by visitors. The lucky winner will be presented with a bottle of Jack Parsnip’s rhubarb wine! As parking at the allotments is very limited, please try to walk to the site if possible. Dogs are not allowed on the site except on the car park area. If you are inspired and think that you might like a plot yourself, they become available fairly regularly, so do get in touch with the membership secretary, Jennie Roshier jennieroshier@icloud.com or Robert Jones jackparsnip1946@gmail.com.